It’s almost midnight here in California—I should really be in bed right now, but instead, I am staring at a computer screen, fingers flying across the keyboard, writing this article. Meanwhile, my goldfish, Caramel and Cream, are in their fish tank, “asleep.” What exactly does it mean for a fish to be asleep? To address this question, it is important to address our preconceived notions of what “sleep” is. For humans, sleep is a complex concept where we go through six stages of “unconsciousness,” typically with our eyes closed and muscles relaxed. For fish, sleep is something similar to our sleep, yet something with its own peculiarities as well. Different fish sleep in different ways, with some even burrowing themselves underground or hiding in anemones (clownfish). Most freshwater aquarium fish, however, sleep in similar ways. 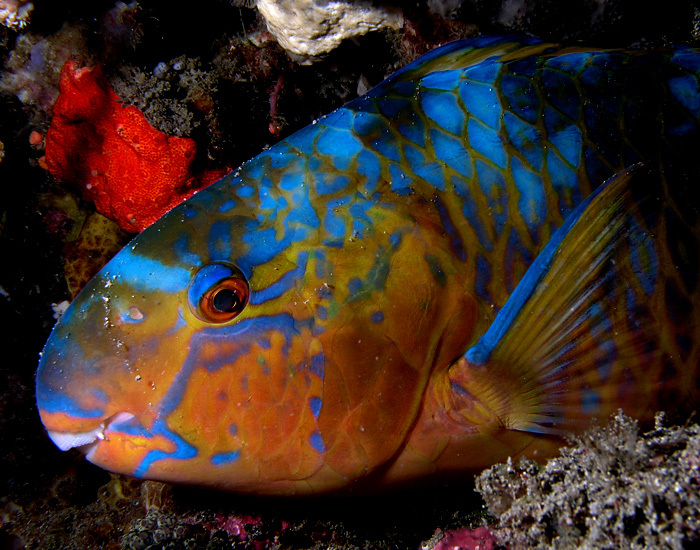 As almost all fish do not have eyelids, you can not determine whether or not they are sleeping by looking at their eyes. However, there are some other key behaviors that can tell you whether or not a fish is sleeping. When fish are asleep, they hover in place, resting. Also, their colors tend to fade and they tend to drift lower in the water. This is because fish are less alert and slow to react while asleep. In the wild, this helps fish survive as they are more camouflaged from predators when their colors are less bright and more hidden when they are further from the surface of the water. Generally, people sleep at night. Some fish sleep at night, while others are nocturnal. However, fish are capable of sleeping at any time and will do so more often when no mental stimulus is present. Overall, there are definitely some parallels between humans and fish when it comes to sleeping. We generally have a time in which we sleep, but occasionally our sleep schedules get off. We are also less alert and stay in place. However, fish sleep with their eyes open and lose their coloration while sleeping. Both humans and fish need sleep to function. Without it, we struggle to live to our full potential. Speaking of which, I should really go to bed now—it’s late. Thanks for reading this exploration into how fish sleep (published 3/6/16)! For more information, please browse around aquariumkids.com! Feel free to contact me at evanb [at] aquariumkids [dot] com with any questions.